analyzes the entire telephone system, 24 hours a day, for telephone wiretaps and other possible intrusions placed on the line. This includes the telephone, and the complete telephone line, from inside your residence all the way to the telephone company. The TLLA-2000 does this by carefully monitoring for variances in impedance, load, voltage and other characteristics that change when an intrusion or wiretap (tap) is placed on the line. The TLLA-2000 then immediately alerts the user of the presence of a wiretap or other device, by the use of a silent indication on the front display panel. 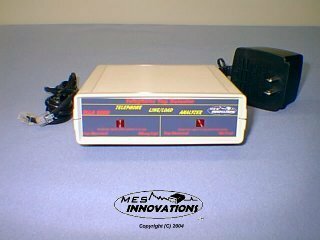 The Telephone Tap Detector TLLA-2000 is designed to detect even the most sophisticated eavesdropping devices that may be installed anywhere on the subscribers telephone line. These devices include the most common Series and Parallel devices, Infinity "remote activated" type taps, Telephone Tape recorders, Extension eavesdroppers and Lineman's Headsets. It will even detect hard to find Capacitive and Inductive (non-loading) type taps. It has Ringer indication and In-use displays, letting you know the exact condition of the telephone line. Plus, it can detect the most sophisticated type of telephone intrusions of all. These are "Remote Extension Drawn Loops", which are Legal and Illegal Taps placed at the Telephone Company's Central Exchange. The TLLA-2000, with the usage of it's microprocessor technology, looks at all of the available parameters of a telephone line pair for anomalies, not just one. The only valid method of detection of hidden telephone wiretaps or tap devices, is to first identify the intrusion and then locate and remove the wiretap problem.. Remember, that our equipment is only a tool used to aid a person in the field of counter surveillance. Only the human being using knowledge, skill, and a methodical approach can find a surveillance device and remove it from operation. Our in-depth owners manual can instruct the individual to where a possible wiretap may exist, aiding the user in the proper identification of the hidden wiretap device to provide a proper counter measure solution. Sturdy ABS plastic case: Size 5.25" X 5.25" X 1.5" -Small, lightweight and portable.. Can be used anywhere. Power: 120 VAC to 12VDC -- U.L. Listed Wall Transformer- Does not "draw" power from the telephone line. This provides for better accuracy, and is telephone company "friendly". This also provides for 24 hour continuous protection whether your using the phone or not. Display: 2 LED's that indicate (ON HOOK) & (OFF HOOK) taps.- Easy to read illuminated display, no complicated "meters" to read. Fully micro-processor controlled. Free Lifetime Tech Support* - by telephone or email support from our specialists..
*Lifetime technical support is free to our customers, once they register. Free Registration Form comes with product line.